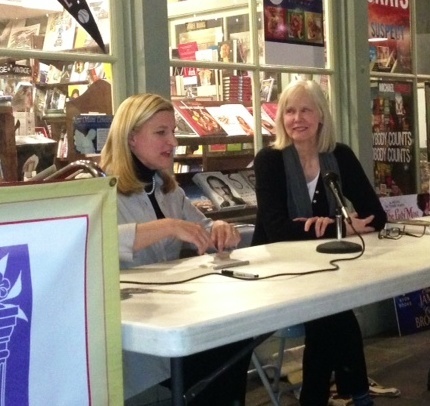 Ruta Sepetys spent an hour entertaining the juniors with stories of her life before she became an author and after when she spent years researching the historical background of her two novels, Between Shades of Gray and Out of the Easy. The students were an enrapt audience as she told each funny and harrowing tale that she experienced. Initially, Ruta, wanted to sing opera, but found out early on that she was no good at it. So with her finance degree, she figured out a way to combine her love of music with management and build a career. She began her career in Hollywood as a music manager and spent 22 years as a manager. We are so lucky that she finally ditched that job and chose to write. Her first book is based on her family's history in Lithuania. The students were riveted by how she applied the "method acting" that she experienced in Hollywood to her research. She spent hours locked in a train car that was used to transport Eastern Europeans to the Russian death camps. It still had blood stains and scratch marks on the walls. Then she paid to take part in an extreme simulation experiment and was locked in a former Soviet prison for 24 hours. She realized from that experience that she would never have survived deportation or be a hero and help others imprisoned along with her. It also taught her that authors do not have to engage in such radical tactics to complete research for a book. She came to school to talk about her newest book, Out of the Easy. Set in a 1950's New Orleans, the book takes place mostly in the French Quarter. That is only about a 15 minute drive from school. She found author, Chris Wiltz, who was a font of information and helped her tremendously in the research for this book. Chris hooked her up with a gangster who showed Ruta the seamy side of old New Orleans. Though Ruta incorporated some of the stories that she learned by talking to Chris and this man into her book, the heroine of the book, Josie, is purely fictional. Ruta imagined her protagonist after her father explained that the 1950's were not such a happy time, and your life was determined by your birth. He was thinking about being born in the right family, but Ruta thought the more interesting story would be if you were born in the wrong family. Josie's prostitute mother and unknown father were definitely not the right family, but through determination, Josie works extremely hard to overcome the burdens of that family. Ruta's formal talk ended an hour after it began, but students clustered around for another hour getting their books signed and talking with her. She was so kind to oblige them. Several of the students who had read her book wanted to talk motivation for specific characters. Their insightful comments let her know that they had truly enjoyed her work. When she told one of them that as an author she loves hearing from her readers like them, one of the students told her that as a reader she loves getting to talk to an author like Ruta. Later, Ruta told me how she felt that visiting PFTSTA was one of the best events that she ever did. She was awed by the students who were such deep thinkers and feelers. What a wonderful afternoon we had. Thank you Ruta for stopping by our school. Also, thank you to Penguin for making it all possible. You can find more pictures of the event on the library website here.